Me and My SoldierMan: Oh My Gravy!!! I haven't had a TV Tuesday in forever, have I? Well, I think this calls for one. The Amazing Race finale. I have to say, as far as finales go, this was one of the least stressful ones I have watched. My girls didn't win, sadly. Jet and Cord are coming back!!! Anyway, next season is a "favorites" season, where fan favorites who didn't win come back to compete again. And there's no question (at least if you go by facebook) that Jet and Cord had the biggest fan following in the history of the show. Yes, Brooke and Claire will be there as well, and the Globetrotters who I also loved, and Miss North Carolina who I loved, but sorry, Jet and Cord are my boys. And of course, anything can happen when it comes to flight times or crappy cab drivers, but I really believe the boys can bring it home next season. Um, can you tell I'm excited??? Oh my gravy! The cowboys are coming back!! 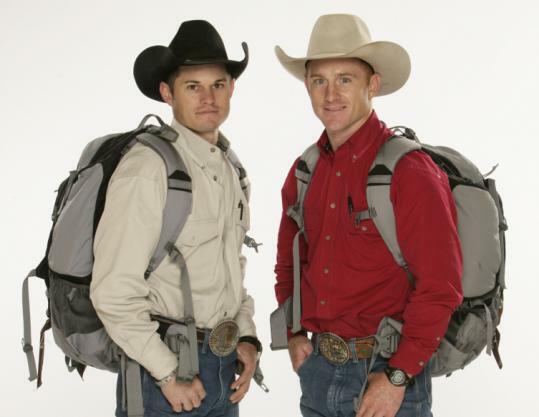 By the way, if you don't watch Amazing Race, you totally should. New season starts in February. I was so excited for the cowboys to come back!! Okay, so I have to admit that I have never watched this. I don't really even know what it is all about. Yes, I live under a rock. brook and claire were my favorites by FAR!!! they made me laugh every week!!! I don't know if I ever told you this but when my dad was in the hospital I met these guys. They had an uncle in ICU. They are so nice! Jet and Cord are so freaking cuteeee!! ..Too bad i'll be in Basic Training during the next season :( Booo. Well, I have to admit that the doctors were my team and I was proud of them for winning. I was very happy for Brooke and Claire to be the second team, though. I really did like them, but I picked the doctors from the beginning. Anyway, I'm psyched for this new season, too! Love the cowboys! !